Fred Phelps, the repugnant leader of Westboro Baptist Church and the “God Hates Fags” protests at fallen soldiers funerals has one thing in common with Martin Luther King Jr., the most important figure in the civil rights movement of the 50’s and 60’s who died in pursuit of equal rights and treatment of all people. That one thing they held in common was that they both believe(d) that the Bible is the Word of God. There aren’t two people that I can say are more different than these men, yet they are both believers in this supposed “holy” book and consider it the inspiration for their life’s work. How can two people so unquestionably opposed to one another in every way believe that this book is inspired by their same god? From the outside looking in it can be rather bizarre for the non-believer to understand why books like the Bible and the Qur’an hold such wide appeal, so much so that they are the most printed books in the history of print and because so many people have faith in their words they are the most trusted and believed works of all time. What drives people to these books? Is it simply the tradition or do they hold some great advantage over other books to embed themselves into societies? Most surely it’s a combination of things, but I’d like to examine why it is that the books are so beloved as well as why such seemingly different people can and do adhere to the same texts. I don’t want to discount Tradition, it has certainly helped these books maintain their grasp on humanity, I don’t think there is any doubt about that – if you aren’t sure just ask your parents or grandparents if you can look at the Family Bible – most families (especially here in the South) have one or multiple and they use them to keep up with weddings, births, and deaths in the family. Religion is more often than not passed down through the generations of a family and these books are given prominence. Tradition is the reason that most Americans have a Bible somewhere in their homes, but that doesn’t mean any of them actually read it. For most the Bible is just a book that sits in a cedar chest or on your bookshelf collecting dust, for others it’s the source of inspiration for their every word and deed. For Martin Luther King Jr. the verse below would have acted as a sort of commission. It would have spoken to him to unify his church in a spirit of love, kindness, and humility. It would have told him that non-violence was the way to seek justice for himself and all people and to pursue peace with his enemies. I think it’s a beautiful verse that we should all attempt to adhere to, if it came from any other book in the world I’d say the same. It’s motives are good, it is pure in it’s message and were this all that the Bible had to say about things I’d probably be handing them out on street corners myself. There are ton of other examples of similar verses with similar messages strewn about the Bible that would have reinforced MLK’s message of peace and tolerance. We can see quite clearly that there is a certain disparity between the words of the book as a whole; it’s message is one when looked at from a less biased perspective that morphs distinctly quite a few times from beginning to end. Why then does it so easily appeal to people? The answer, I propose, is because it distinctly appeals to the prejudices of mankind. Martin Luther King Jr. found peace, love, and tolerance in the Bible because he was a loving, peaceful, and tolerant man that needed a god that felt the same way he did…his understanding of the Bible confirmed that because it best appealed to his very nature. Good men will find justification for goodness in holy books, were MLK a Muslim the Qur’an would have been used no differently despite it’s distinctly contradicting messages. Fred Phelps finds the murderous, angry, and hateful god because that’s what he is – an angry, homophobic, and wrathful man in need of justification for who he is and what he believes. Phelps and Family are a result of their bias and what the Bible tells them (and a strong dose of brainwashing for the kids). 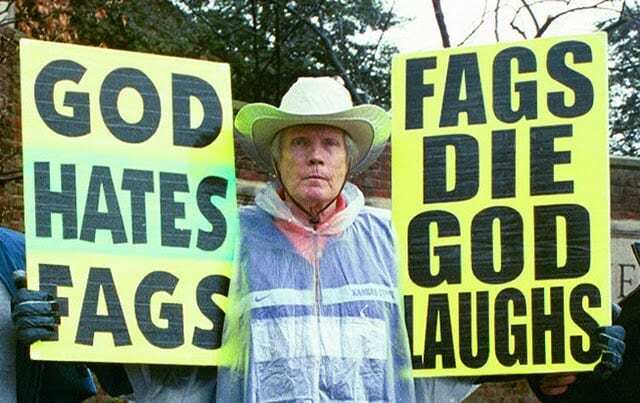 Fred Phelps holds up signs of hatred. This, I suspect, is where god belief and doctrine really originate from: Men need to justify or solidify the power they have, declare war on other tribes, keep control over women, etc. and so they must find a divine progenitor of those desires in order to justify them. Holy Books appeal to us because they are written by people, they have messages that will appeal to all sorts of people because all sorts of people were involved in writing them and this, in my opinion, is evidence of their frailty as opposed to their divinity. Good people will find and keep good things from the Bible, somehow looking over the rest. Bad men will find the hate they so desire and put away that which they despise. Religion is convenient in that way.